When petite, blonde, blue-eyed Elle, with her expensive running shoes and Yale sweatshirt, goes running through the Bel-Air streets at dusk, she looks like she belongs, but she has a secret. Elle is actually a cat burglar and a very successful one. Stealing mostly cash and jewellery, small objects she can stash on her person when she leaves, she gets by well enough to have her own small home and lead a comfortable lifestyle. Then one day, while searching a supposedly empty house for valuables, she stumbles on the bodies of three people, obviously murdered. A camera that was set up in the room has recorded not only the murder, but Elle. Now if she reports the crime to the police she risks getting arrested, but if she doesn't, the killer might find her first. 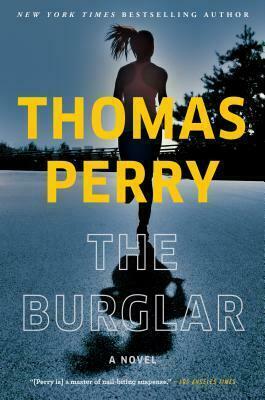 The Burglar is a clever, suspenseful thriller with an unusual protagonist. The plot is a little slow to get going, with lots of details about how Elle's world works and the "esoteric knowledge" needed to be a good burglar. Readers be warned- this book may make you paranoid about your home security, since Elle spends a lot of time being amazed at how easy most homes are to break into and how lousy most people are at hiding valuables. The story does speed up a little as it goes on and the stakes get higher, building towards an exciting conclusion. The motive for the murders took me by surprise and the overall plot kept me guessing for most of the book. I liked Elle as a character, with her troubled past and insights about human nature such as the following quote: "It was interesting to her how often men said they didn't understand women. They were right that they didn't, but it wasn't because women were uncommunicative. Plenty of women she knew talked almost continuously. The problem was that men thought of themselves as being more similar to anything else on the planet- male horses or wildebeests or chipmunks- than to female human beings. Women were their opposite. To them, a thirty-two-year old male physicist was more similar to a billy goat than to a thirty-two-year old female physicist." Elle is funny, talented and lives by her own questionable, but consistent, set of morals. I'd be interested to read about her further adventures if there is ever a sequel. The Burglar is an enjoyable, read, with a plot that doesn't feel formulaic and a protagonist you'll want to follow to the end. Disclaimer: I was given a complimentary copy of this book by Mysterious Press, via NetGalley, in exchange for an honest review.